Agriculture Commissioner Sid Miller appears to be in the most financially competitive statewide primary, with his challenger, former lobbyist Trey Blocker, reporting a higher cash-on-hand number ahead of the March 6 primary. Governor: Gov. Greg Abbott's already massive war chest grew to $43.3 million after he reported raising over $9 million between July and December. That's orders of magnitude above the fundraising reported by the group of mostly unknown Democrats who have lined up to challenge him. Andrew White, the son of late Gov. Mark White, appeared to be the financial leader in that primary field, taking in over $200,000 — $40,000 from the candidate himself — in the first three weeks of his campaign, giving him $104,000 cash on hand at the end of 2017. Another one of the higher-profile candidates, former Dallas County Sheriff Lupe Valdez, raised $46,000 in about the same time and reported having $40,000 in the bank. Lieutenant governor: Like Abbott, Lt. Gov. Dan Patrick is lightyears ahead of his challengers in the money race. He raked in $2.6 million in the last half of 2017 on his way to building an $18 million war chest. His primary opponent, Scott Milder, raised $40,000 after announcing his campaign in early November, lent himself $10,000 and entered 2018 with $40,000 in the bank. Meanwhile, the Democrat running for lieutenant governor, Mike Collier, reported taking in $129,000 and received a $140,000 loan from a business tied to him, leaving him with $143,000 cash on hand. Agriculture commissioner: This appears to be the most financially competitive statewide primary, with Agriculture Commissioner Sid Miller's Republican challenger, Trey Blocker, disclosing a higher cash-on-hand number than the incumbent: $487,000 to Miller's $402,000. Blocker, a former lobbyist who announced his bid in late November, went on to raise $50,000, while Miller took in $106,000 over the full six-month period. 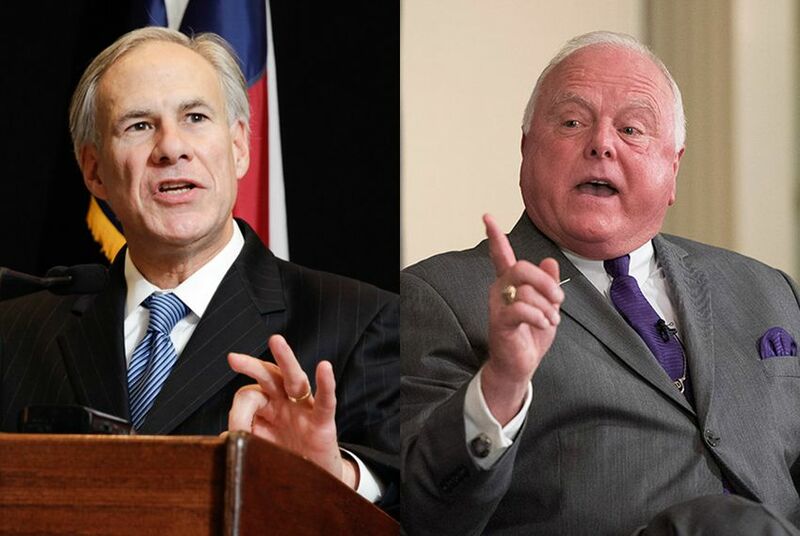 Both were buoyed by $350,000 in loans — Miller loaned himself $300,000 and got the rest from a single supporter, Dallas businessman Arun Agarwal, while Blocker loaned himself the full amount. Blocker has now put $1.1 million of his own money into his campaign account, which he started during the previous period with a $750,000 loan to himself. Land commissioner: It doesn't look like Land Commissioner George P. Bush needs to sweat money as he faces three GOP primary opponents largely motivated by his controversial management of the Alamo. The incumbent raised $1 million to end the year with $3.4 million in his campaign coffers. His leading primary challenger — his predecessor, Jerry Patterson — reported taking in $89,000 after launching his campaign in early December and loaning himself $20,000 for a cash-on-hand total of $95,000. Attorney general: Attorney General Ken Paxton, who has been fighting securities fraud charges for most of his first term, reported raising $774,000 in the last six months of 2017 as he amassed a $5.7 million war chest. Paxton, a Republican, was one of the only statewide officials who didn't draw a primary opponent this year. His Democratic opponent, Justin Nelson, got $288,000 in contributions following his campaign launch in early November and loaned himself $500,000, giving him a cash-on-hand total of $645,000. His campaign says that number is actually above $900,000 once pledged donations are counted. Nelson's full report was not yet publicly available Wednesday morning. Senate District 8: There is only one open Texas Senate seat in 2018. State Sen. Van Taylor, R-Plano, is running for Congress and the Republican primary to replace him has become a high-dollar affair. The financial advantage continues to belong to Phillip Huffines, the former Dallas County GOP chairman who’s been running since March — and started off with a $2 million loan to himself. His cash on hand is up to $1.7 million after he raised $524,000 over the last six months. Angela Paxton, the wife of Attorney General Ken Paxton, launched her bid in September and has since taken in $476,000. She has $338,000 in the bank. Senate District 31: State Sen. Kel Seliger, R-Amarillo, has a commanding financial lead in his closely watched re-election bid against a pair of primary opponents. He raised $528,000 on his way to building a $1.7 million war chest, numbers that dwarf those of his challengers: Amarillo restauranteur Victor Leal and Mike Canon, the former Midland mayor who ran against Seliger in 2014 and lost by 5 percentage points. Leal launched his campaign in August. Senate District 2: State Rep. Cindy Burkett, R-Sunnyvale, had a strong financial start in her primary challenge to state Sen. Bob Hall, R-Edgewood, raising $322,000 in roughly the first four months of her campaign while he raised $414,000 for the whole six-month time frame. However, Hall had a big cash-on-hand advantage entering 2018 — $198,000 to Burkett's $43,000. Nearly half of Hall's recent haul comes from two $100,000 donations – one from the Empower Texans PAC, a conservative organization, and the other from Cisco fracking billionaire Farris Wilks. Senate District 10: In what’s usually the only competitive Texas Senate district in the general election, state Sen. Konni Burton, R-Colleyville, was outraised by a Democratic challenger, Beverly Powell, $140,000 to $133,000. Burton still has much more money to spend — $365,000 to $65,000 for Powell, a former Burleson ISD trustee. Powell's facing one primary opponent – Allison Campolo – who reported raising $30,000 and having about $4,400 cash on hand. Senate District 17: State Sen. Joan Huffman, R-Houston, is on strong financial footing as she faces a primary challenge from Kristin Tassin, the president of the Fort Bend County school board. Huffman raised $253,000 and ended 2017 with $546,000 in the bank. Tassin, meanwhile, took in $90,000 after announcing her campaign in late September and got a $50,000 loan from her husband, giving her a cash-on-hand tally of $61,000. Senate District 30: State Sen. Craig Estes, R-Wichita Falls, posted a solid sum for his re-election bid — $429,000 — but he's up against a primary challenger — state Rep. Pat Fallon, R-Frisco — with a sizable cash-on-hand advantage, largely thanks to a $1.8 million loan he gave himself from the get-go. Estes has $577,000 in the bank, while Fallon's balances sits at $1.5 million after a haul of just $80,000. Disclosure: Trey Blocker and Jerry Patterson have been financial supporters of The Texas Tribune. A complete list of Tribune donors and sponsors is available here.